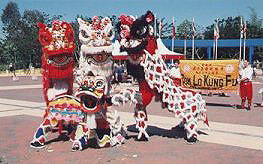 The Lion Dance is one of Chinas most popular cultural events. Often the performers are members of a Kung Fu school, and, if well performed, the dance brings good fortune, prosperity and longevity to wherever it is performed. While the dance is quite often seen during the Chinese New Year celebration, it can be performed anywhere, from the opening of a restaurant to the closing ceremony of a large multicultural festival. The lion is not an animal that is native to China. Rulers of what is now Iran and Afghanistan used to sent lions to the Chinese Emperors as gifts, hoping to persuade the Emperor to allow them to trade with merchants along the famous Silk Road. Dating back to sometime during the Han Dynasty (205 BC – 220 AD), and peaking during the Tang dynasty (716-907 AD), it was performed particularly at religious festivals, and spread to nearby Korea and Taiwan. Two dancers, one of which is inside the head, the other inside the tail, control a Lion. Three musicians – a drummer, a cymbal player, and a gong player, accompany a lion. Quite often a Buddha will also play with and tease the lion. The head of the lion is the one who sets the lions performance. Depending on the skill of the practitioner, this can range from simply walking around moving the eyes and mouth to performing daring stunts like walking on a ball, or standing on the shoulders of the tail person to make the lion appear to be rearing up on hind legs. At some time during the Lion Dance, the lion may come across the choy ching, which is usually a lettuce in which is concealed a Hung Bao packet (lucky red packet). The lion can approach the green, and then may back away, and eventually will eat the green, after which he will spit the remains of the lettuce at the audience. Being hit by the spit greens is very lucky. For the Kung Fu practitioner, the Lion Dance is not just about ceremony and luck. The Lion Dance is an essential part of ones Kung Fu training. It can teach the student footwork, stances, and also enhances ones strength, agility and endurance. 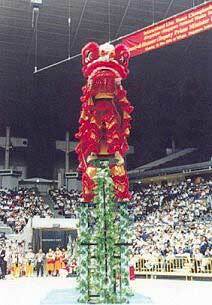 A good lion dancer is inevitably a good Kung Fu student. If you would be interested in our services for your next promotion or official opening, please do not hesitate to contact us.